Hello, all! We are coming up with more slogans for our signs at the protests and rallies. Want to help? Please respond to this post and share your ideas! The first Keystone pipeline has ALREADY leaked 7 times! Help protect our water & land . . .
Tar sands oil is destroying Canada’s Boreal forests & wetlands . . . Think what a major oil spill would do to our aquifer & land! Tar Sands Oil Is NOT Your Ordinary Crude! Nearly 1 MILLION GALLONS of toxic tar sands oil spilled into Michigan’s Kalamazoo River last summer! Our Aquifer is just as valuable to Nebraska as the Kalamazoo! Nebraska needs clean water & healthy land to provide food for the world! We DON’T need toxic tar sands oil putting our economy at risk! Event March 6th! And a meeting! Please come join us for a day of music and activism! at the Zoo Bar, which is at 136 North 14th street. Lincoln, NE. $5 donation requested. If you can give more money, it will be gratefully accepted. Stop the XL Pipeline Action Kits, bumper stickers, buttons, and yard signs available to all. TransCanada pipeline explodes in ‘fairly remote area’ of…Nebraska? I do believe TransCanada has bandied about some ridiculous statistics to back their claims about how unlikely a break in the Keystone XL would be once constructed. Why should people believe their baseless numbers when we see the horrendous destruction that results from pipeline breaks in places like Ontario, Michigan, the Gulf and all over? *The Keystone XL Pipeline would result in increased gas prices, ranging from 7 to 15 cents a gallon for us in the Midwest. *Independent studies from the Department of State and Plains Justice show actual jobs produced and find only 12% of the jobs in Nebraska will actually go to Nebraskans. *TransCanada changes their jobs estimates every time they release their figures,which have gone from 13,000 jobs to 325,000 jobs in a few months. *1000 megawatts of wind development is projected to create 250 permanent jobs in the state. This kind of development provides income for years to come. I, personally, am a fan of unions and of workers demanding their rights. Normally, unions fighting for what they’re supposed to fight for (safe working conditions, fair wages, etc) benefits us all. Unions often advance the common good. The AFL-CIO isn’t fighting for the common good now. They are standing on the side of a multinational corporation. They are standing on the side of temporary jobs, endangering our water, higher gas prices and intimidation of our landowners. They are giving a bad name to unions. 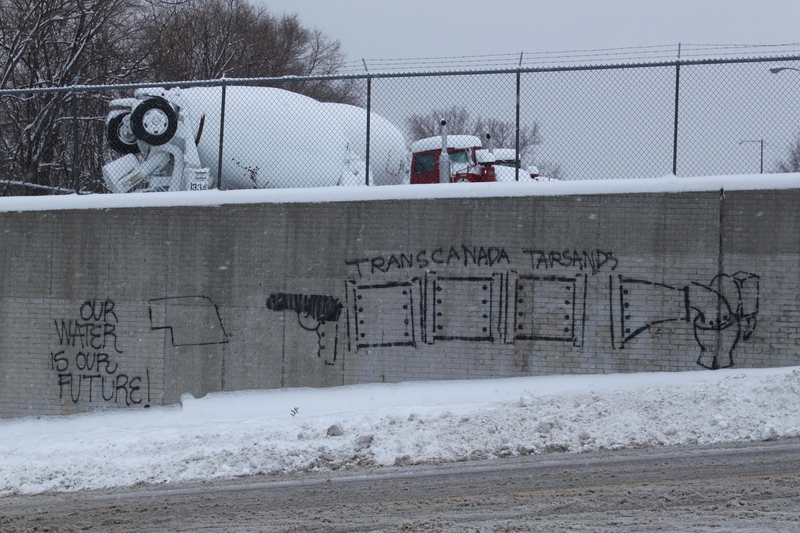 Some of my friends did some lovely public art protesting the pipeline.